These offbeat places to see in Delhi will not only captivate you but will also leave you astounded with its vibrant culture. Recognised as a protected monument by the Archaeological Survey of India, Agrasen k iBaoli (The well of Agrasen) is truly a fine example of architecture. Combined with the ingenuity of the construction and preciseness by the masters of yore, the step well temple structure will surely fill you wonder and amazement as soon as you visit this in Delhi. While no one knows the origins of this step well structure, it is widely believed that is was constructed by the King Ugrasen during the Mahabharata Era. The well, which is amongst the few of its kind in Delhi consists of 103 steps, few of which are immersed in water. The top 3 levels of the well are visible and each of them is lined with arched niches on either side. Situated in the heart of Connaught Place, the present Gurdwara was once a bungalow of Mirza Raja Jai Singh – hence giving its name Bangla Sahib. A sacred place with its deep-rooted history dating back to the Mughal Emperor Aurangzeb, the Gurdwara is known to have saved the residents of Delhi from a severe epidemic. Even today, this impressive Gurdwara attracts devotees from far to take a dip in the holy water here to heal them from suffering. The Jamali Kamali Mosque and tomb constitute two historical monuments that are constructed next to each other. It is estimated that the mosque dates back to around 16th Century and was consecrated under the leadership of Sikandar Lodi, Babar and Humayun who were emperors of the Mughal dynasty. The Jamli tomb was erected in honour of a renowned saint called Shaikh Fazlu’llah who was also called by the name ShaikhJamaliKamboh. Kamali, however, was a commoner who was Jamali’s companion. The lineage of Kamali is not known. However, they are buried next to each other which led to the tomb being called by that name. 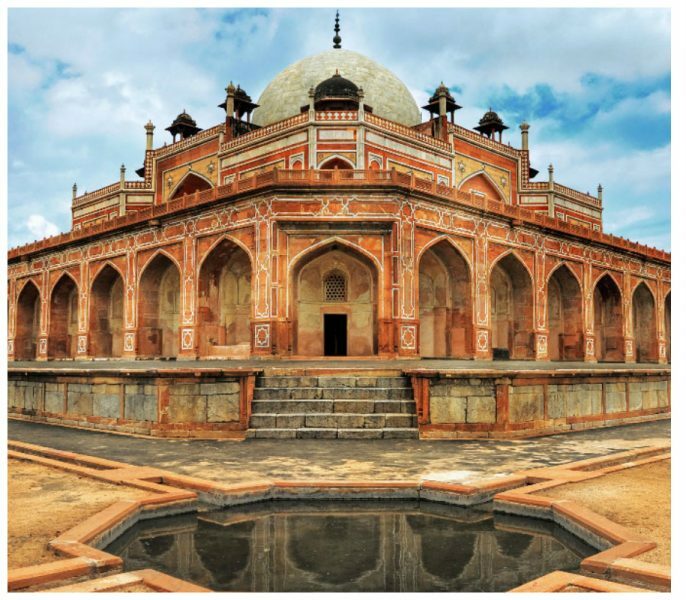 Built with sandstone and marble, it is one of the precursors in the Mughal architecture in India, making it one of the must place to visit in Delhi. The tomb is easily accessible by a metro from Delhi since it is located near the Mehrauli village. If you are the one who gets intrigued by ghost stories, then brace yourself, for this is thought to be one of the haunted places in the city!Exchange travel stories with them, write down theirs, exchange photographs and the destination they have travelled to! Who knows, you may even find a companion for your next journey. Exchange ideas on how you can travel better and in more innovative ways. Located near the Green Park Metro station it can be easily reached by the metro railway. The famous and historical structure of HauzKhas derives its name from a large water tank that is located on its premises. The name HauzKhas translates to mean the ‘Royal Tank’. The complex is essentially an assembly of ruins, that are beautiful even in their wreckage. This rainwater reservoir has metamorphosed into a common hangout for youth as the structure is surrounded by numerous quirky places to eat as well as a shopping district for the people of the city. Have fun taking in the serene beauty of this exquisite place, which is the quietest and yet the most exuberant of all tourist places in Delhi.